Scary Monsters magazine #87 - Svengoolie Returns! - Choose cover! 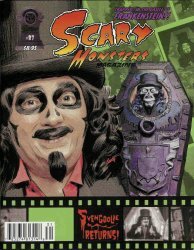 MyMovieMonsters.com > Scary Monsters Magazine > Scary Monsters 1-100 > Scary Monsters magazine #87 - Svengoolie Returns! - Choose cover! Tribute of horror host Svengoolie! Scary Monsters magazine #87. Huge 164-page issue for true classic horror/sci-fi fans! Choose standard cover (original art by Terry Beatty) or variant cover (color photo). Monster Memories of a Horror Host Part 2 Sven Speaks! Plus many more Svengoolie features! ... a whopping 164 pages! Collectors Note: You must choose your preferred cover at the drop-down menu above. See images below for cover art/photo.